My main purpose of heading to The Grove was Ladurée because of their famous macarons. Little did I know that Ladurée will be coming to Toronto soon! I expected more from the Lavender and Salted Caramel flavour, I’ve definitely had better elsewhere. I found the Chocolate flavoured macaron felt kind of stale and nasty, thus the lowest score out of the 6. I didn’t expect the Coffee flavour to be one of the better ones, which really surprised me – I liked how rich it was without being overly bitter. I was worried that there might be a massive line up upon reading the reviews on Yelp. But it wasn’t as long as I had anticipated. I also found out that it costs $25 USD just for a box to put my macarons in… I do not see a box being valued at $25 USD so I settled for a paper bag instead. That made me really cautious when carrying the macarons back since I didn’t want them to break… boo 🙁 . I thought they would have just given a plain box or something for those who don’t want to pay for their fancier boxes instead of a paper bag to hold my macarons. I would probably visit Ladurée in Toronto when they arrive to give the macarons another go. My go-to macaron flavour is Salted Caramel. I always have to try a Salted Caramel macaron whenever I go to a new macaron place. 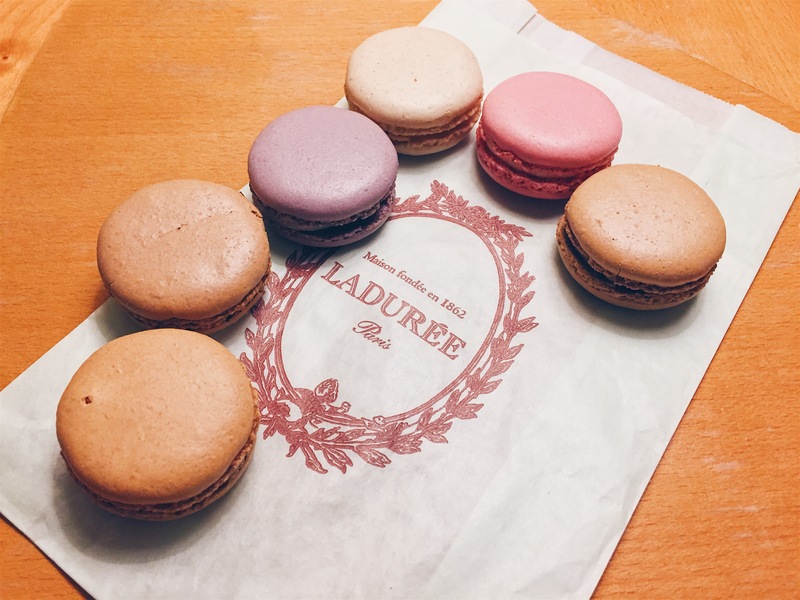 What’s your favourite/go-to macaron flavour?